Tuesday morning 11/6/12 was a frosty one. I actually forgot to set my alarm the night before and my wife wakes me up at 5:30 am. CRAP! OVERSLEPT! I take a quick shower, run out there and get settled in by 6:20. By 7:30 I hear something walking behind me. I take a look over my shoulder and see this massive buck walking downwind of me 25 yards! I didnt have my bow in my hand yet so all I could do was watch him. He walked in and hit the scent cone of the estrous and locked up. Standing there for an eternity licking his lips and sniffing, he started walking away. I let out a doe bleat, nothing. I grunted and he turned and looked, but kept walking away. Then I snort wheezed at him and he turned slightly and stood there forever. Then he did a disappearing act. I thought he was gone. I was glassing the area all over and couldnt see him. I then began to rattle and grunt aggressively... nothing. An hour passes and I look over to where he disappeared and I watch him get up! He was laying there 50 yards the whole time! He made his way back down the same trail he came in on and I knew I'd have one small lane to thread the needle through. When he walked through I "mah'd" and he stopped about 23 yards away right where I needed him to. I hit him right in the shoulder with a Spitfire Maxx and it stuck in the offside shoulder. He ran about 80 yards and crashed. I put an arrow through this buck last season high in the shoulder and never found him. 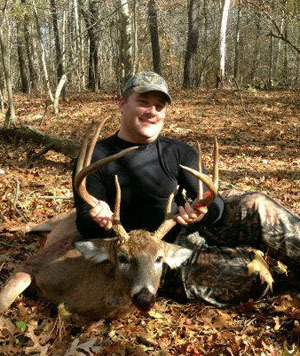 This buck was killed in Suffolk county, Long Island on private land. We rough scored him at 135 and he weighed 155 dressed. Im waiting on the age. I got it all on video. Life is good.